A chilly February evening, in a packed hall, with a glitterball ceiling more accustomed to beery gigs and dancing, saw the launch of Another Europe is Possible with a broad range of speakers proffering support for a different kind of European Union. The launch was devoid of the dry, technocratic jargon and stale, cold language of narrow self interest, that so disfigures and stifles debate about the EU. Instead, it proposed a people centred Europe, a Europe based on hope rather than fear; a European Union with social and environmental justice at its heart. It proffered a confident, outward looking Europe rather than an inward looking Britain – one that recognised that working with others was likely to be more effective than doing things on our own. There was a strong recognition that the EU is seriously flawed with deep democratic deficiencies and a myopic, destructive economics that has inflicted much misery but nevertheless in a globalised world it offered the potential for tackling climate change, strengthening worker rights, fighting corporate tax evasion and dealing with the refugee crisis – summed up in the campaign’s slogan‘stay in Europe to change Europe’. 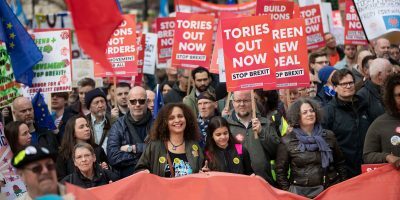 Many speakers expressed a sense that Brexit would entail a further shift to the right, that narrow nationalism would erode the protections and rights that have been won in the EU, and that, for all its flaws, leaving the EU would make matters worse. 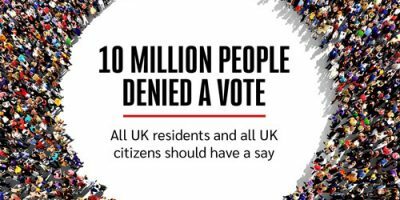 Some also noted that there may be a very short timetable – little more than four months (June 23rd) – before the referendum is held. The range of speakers was wide – Asad Rehman, from Friends of the Earth, Marina Prentoulis from Syriza UK, three MPs Caroline Lucas (Green Party), Stephen Gethins (SNP), Hywel Williams (Plaid Cymru), Syrian refugee and PhD student Mohammed Ateek, striking Junior Doctor, Janna Bowen, Labour Party activist and writer Michael Chessum, from the NUS Sahaya James and Save Lambeth Libraries campaigner Ruth Cashman. 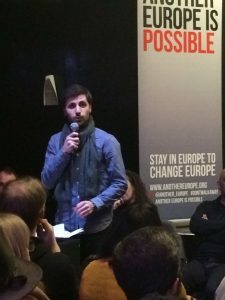 A series of alternatives was evident in the contributions from many of the speakers; a Fortress Europe against an Open Europe, a neo-liberal Europe versus a social Europe, a business centred or a people centred Europe, the solidarity of peoples or the divisions of nationalities, an unaccountable Europe or a democratic Europe, the freedom of movement versus the freedom of capital. The stand out speaker was the Green Party MP (and former MEP) Caroline Lucas. She made clear the desperate, dismal, dreary paucity of Cameron’s deregulatory vision of Europe, that he was the most ardent advocate of the Transatlantic Trade and Investment Partnership (TTIP), but that leaving the EU would not lead to a more benign trade policy. The fact that the stronger regulation of bankers was an issue that particularly provoked his ire was telling. In the Paris climate talks, Caroline noted that the EU had raised the environmental standards of countries like Poland. 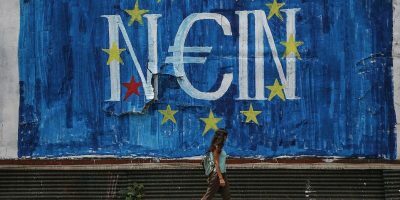 She argued for a Europe in which every EU country had a minimum wage; that the idea of a basic income should be explored in every EU country and that a new economic model be pursued – one that recognises that the planet has finite resources. Moreover, she criticised the ‘Stronger In’ campaign for not having values based arguments, but for instead pursuing a narrow, instrumentalist approach. Finally, she felt that we should not neglect the ‘peace dividend’ of the EU – that before the EU the continent had been riven with conflict and that now, be it ever so cumbersome, differences were dealt with by discussion and debate – a far better option. The biggest welcome of the evening though was for striking Junior Doctor Janna Bowen. She noted that a fifth of all new doctors are from the EU – of her seven colleagues, five came from the EU. EU workers are vital to the NHS. She also noted the positive impact of the Working Time Regulations – which brought in protections to stop tired doctors making mistakes – and the greater pool of scientific resources when EU countries work together. Many other issues were issues by the panel and the audience. These included the implications of the leftward shift in Portugal, Spain and Greece; the curious bedfellows emerging in this debate – such as Plaid Cymru finding itself in the same voting lobby as the Ulster Unionists; the dilemma posed if England votes to exit and Wales and Scotland vote to remain; that the mainstream ‘In’ campaign looks like the establishment and is run by establishment; the EU’s positive role in introducing regulations tackling the sewage on our beaches and the air pollution that blights so many cities and damages so many lives. One audience member, a young Polish migrant worker raised the virtues of the freedom of movement and how concerns over issues of security of employment had spread from British trade unions to the Polish diaspora. 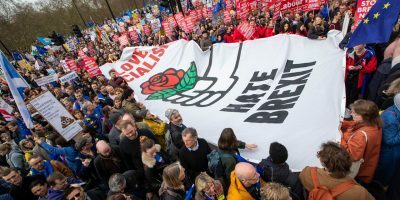 Speakers contended that we would still shaped by laws that we could no longer influence’; the dangers of post-EU ‘race to the bottom’ economics were noted, further weakening worker protections and diluting environmental safeguards. The event concluded with some final thoughts from the panel. For all the virtues of Facebook and Twitter – in many ways, they preach to the converted – the importance of looking outwards and talking to people was a lesson from both the current doctor’s dispute and the Scottish referendum, in essence, the revitalisation of grassroots campaigning. Constructing a coalition of disparate voices but around some common aims seemed to characterise the event – one that humanised an ‘In’ campaign, where the abstract can lead to apathy. 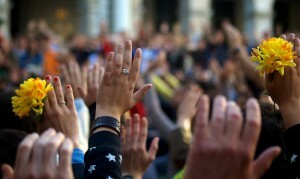 A campaign based on hope rather than fear is always the more appealing prospect. This article was first published at Philosophy Football. 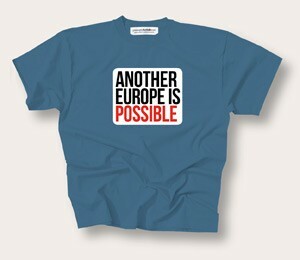 Philosophy Football’s Campaign T-Shirt Another Europe Is Possible is just £9.99 and available from here. 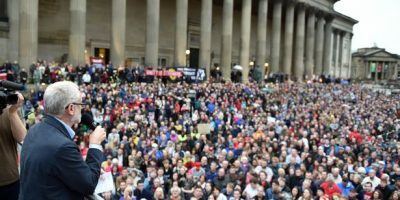 Another Europe is Possible is an alliance of progressives fighting for an alternative to extreme Tory Brexit.